At a mere 5 oz. the Leatherman Skeletool has a stainless steel combo blade, pliers, bit driver, removable pocket clip and carabiner/bottle opener. This multifunctional device is just what you need to perform a variety of maneuvers and operations in one good-looking package. It's equipped with a 420HC stainless steel clip point combo straight/serrated knife, needle nose and regular pliers. 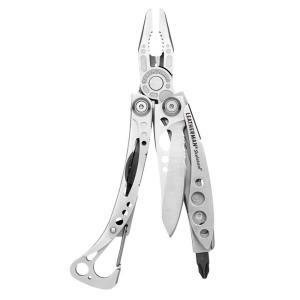 Tbook.com crawls the web to find the best prices and availability on Leatherman and related Tools and Hardware products like Leatherman Tool Group Skeletool 7-in-1 All-Purpose Multi-Tool. For this page, related items include products we find that match the following keywords: "Leatherman" at our vendor partner Home Depot. Leatherman Tool Group Skeletool 7-in-1 All-Purpose Multi-Tool is one of 14 Leatherman and related products listed in the Tools and Hardware section of Tbook.com If you have any questions on this product, please give us a call at 734-971-1210 during the hours of 9am - 5pm EST for assistance. Thank you for shopping at Tbook.com, the Internet Department Store!